The blog, “Writing the Holocaust,” as of this morning has just two blog posts, one for March and one for April. But it’s of interest to me nevertheless. 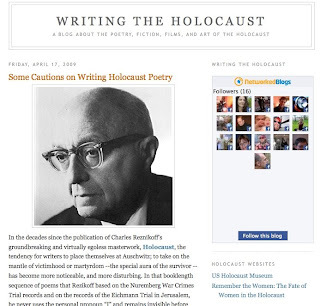 April’s is a longish entry giving “some cautions on writing Holocaust poetry.” It begins with Charles Reznikoff and makes reference to Holocaust verse by Snodgrass, Rich, C.K. Williams, et alia.